Using a 12v rechargeable battery pack I had laying around and a dummy LPe6 battery - camera reads 12volts and appears fine, but I turned it off fast. Is this OK or not? To power the camera at 12v through the dummy battery? What's the official BMD word. Last edited by robcart on Wed Nov 14, 2018 7:32 pm, edited 3 times in total. Not really, you need a regulated 7.5VDC power to the dummy battery, to be absolutely safe and not damage the camera. The expected input is likely that 7.2-7.4VDC for using the battery or dummy battery. I’d call BMD Support and ask if it can take 12VDC voltage safely. It may have worked safely the brief time if you only had the camera running. But it’ll be more of a concern as you add things like phantom power and external monitors and run that way for hours. Good to know, Rob, as some new battery sleds output 12VDC with 2 larger batteries on board. Reading that note from Blackmagic does not confirm that it is safe to supply 12 volts via the battery compartment. Generally, one assumes that dummy batteries are regulated, converted to 7.2/7.4 volts. Get confirmation that 12 volts is acceptable, in writing. Good idea, Leon. I assume that 12VDC was part of the conversation that resulted in the note, but better if it was explicitly stated. If you check the battery voltage after being fully charged, you'll see that it's around 8.4V. That's normal for just about every 7.2V-7.4V battery. On the other hand, 12V is way over that limit and I'd never try and apply such voltage to any camera that uses a 7.2V battery. My V-Lock battery has a 7.2V outlet for the dummy battery and the connector cannot be placed in the 12V outlet. The only thing that you need to be careful of with a 12V supply is that it is only 12V and not say 14V+/- when fully charged. I have some 12V Li-Po batteries and when they are fully charged, the voltage is around 14.6V. Interesting that the camera internally requires 12VDC to operate so it steps-up the voltage internally. May explain why the supplies battery or even a genuine battery don’t operate for long. Even better then if a battery sled delivers regulated 12VDC to the dummy battery. The pocket and 2.5K cinema camera are both happy with 12v supplied through their ports. It even shows that range on the cover by the jack. This is very interesting, so Tom please keep us informed on how you proceed from here. I followed the email thread you provided and I have to admit that the word "should" does not inspire confidence. The idea that the camera can be powered by 7.2/7.4 volts (internal) and 12 to 18 volts (external)and charged via USB C(5 volts) "should" indicate that there is a sophisticated power management system going on. As pointed out by Ray(that's what it is) , 12 volt batteries can be higher. Rick, you make a good point about why the 7.2 volt batteries drop out so soon, if 12 volts is the optimum operating voltage. It would be appreciated if Tony could shed some light. Chris Adler wrote: The pocket and 2.5K cinema camera are both happy with 12v supplied through their ports. It even shows that range on the cover by the jack. 2.5 BMCC has internal wired battery, no doubt 12 volts. I do not think that the Pocket camera can operate on 7.2 volts from the external 12 volt power input. That 12 volt port acts a charging port when an internal battery is detected. This would indicate that the pocket has separate power management for the internal and external voltages. I have a battery that can switch between 9 and 12 volts and I have noticed that the BMPCC will work on 9 volts. I do not know for how long and whether it will power with an internal battery. Interesting thread. I was a little weary of using a dummy battery solution to power my PCC4K, and first ordered a dual-USB to dummy from Amazon, that I connected to two of my Anchor power bank's USB ports...the PCC4K briefly powered on then off immediately, which made my heart skip a beat. I immediately put that dummy battery back in its packaging and returned it to Amazon. I then found another dummy battery that I had purchased for my Canon 5D mkIII and forgot about it being in my camera bag...that one has a barrel connecter that is fit for my Anchor power bank's switchable 9V/12V output, and when I tried it, at 9V, the PCC4K powered on and stayed on. I was still unsure whether this is a safe way to power it, but after reading here that 12V seem to be ok'd by BM, I feel a bit more confident. The question then is, would it be better to use the 9V or 12V setting on my Anchor, to power the PCC4K? PS: anyone know how I change my profile in such a way that it will say my real name at the top, rather than as "Real Name: Till Krueger" at the bottom of the section to the left of each post? rick.lang wrote: Interesting that the camera internally requires 12VDC to operate so it steps-up the voltage internally. May explain why the supplies battery or even a genuine battery don’t operate for long. Even better then if a battery sled delivers regulated 12VDC to the dummy battery. I think this is the main point here. And it helps to explain why all the battery issues exist. Stepping up the voltage by over 50% will require batteries to deliver more current than they are likely expecting when designed for Canon cameras. At the same time it just occurred to me it is possible Canon also steps up the voltage for their cameras. EDIT: After a little research it appears Canon cameras do not step up voltage. Last edited by Earl Green on Sat Nov 10, 2018 11:31 pm, edited 1 time in total. tillkrueger wrote: Interesting thread... The question then is, would it be better to use the 9V or 12V setting on my Anchor, to power the PCC4K? I think I’ll be using the sled with two batteries that provide 12VDC out for a dummy battery knowing what the camera really uses. It can’t hurt and now I can easily determine the wattage the camera is using knowing my Ah and the voltage and the time to drain the batteries. PS: No, sorry but that’s the way their forum software works. rick.lang wrote: I think I’ll be using the sled with two batteries that provide 12VDC out for a dummy battery knowing what the camera really uses. It can’t hurt and now I can easily determine the wattage the camera is using knowing my Ah and the voltage and the time to drain the batteries. what sled is that, Rick, do you have a link? is that an item Blackmagic sells for this camera, or a generic item one can buy somewhere else? it holds two LP-E6 batteries? so would you say that I'd be better off running my dummy battery at 12V or the 9V setting of my Anchor power bank, or does it not really matter? rick.lang wrote: PS: No, sorry but that’s the way their forum software works. ah, ok. I only asked because I see that many users have their real name up top on the left, rather than their username, like I have at the top. Just wanted to mention that I have been operating the camera through a dummy and a BP-U battery plate with 16.7V Sony BP-U60 batteries for about 2 months now and over 100 hours of shoots. This config has been used on 3 different copies of the camera without problems. The 16.7V indication is when fully charged and it slowly goes down. not to sound like a broken record, but should I run my dummy battery on the 9V or 12V setting of my Anchor power bank...does it matter, if both settings power the PCC4K? tillkrueger wrote: very informative indeed. You may have gathered by now that this thread has thrown a cat amongst the pigeons. But I will put my paddle in and stir because you are looking for an answer. I personally would not put anything higher than 8 volts in the battery compartment via dummy battery. Heat may be an issue. However others have done so and lived to tell the tale. But if you insist, try 9 volts and see how long it takes for the battery to drop to a voltage that can no longer keep the camera running. You may find that the battery will last longer because of lower voltage. Good luck and may the Gods of good fortune shine upon you. I think we have entered the Wild West with this thread and some guidance from BMD would be appreciated. Thanks making the effort, Leon. Since my question relates to a dummy that's hooked up to an external Anchor 20,000mAh power-bank that can either feed 5V to USB, or 9V or 12V through a DC barrel connector, I was wondering about the voltage...the dummy should stay at 9V for about as long as 20,000mAh can power the camera, which would be roughly as long as 10 of the LP-E6 type batteries that shipped with the camera (minus what old-age has taken away from its original 20,000mAh capacity)...so my hope is that I should get a solid 5-6hrs out it, maybe more. But like you said, it's the Wild West now, with these theories, and only time will tell. Ultimately, I'd like to see a neat external solution that feeds 12V through the 2pin port, simply because I don't like that cable hanging out from the battery compartment and having to remove the battery compartment door to be able to this, but I also don't want to schlepp an Anton Bauer sized power brick around with me...defeats the purpose of buying a "Pocket" sized camera, even if the PCC4K's size doesn't really deserve the name anymore. So if anyone can find a barrel connector to 2pin cable that's available *now*, please do link to it! or even the compatible version of the connector, on its own, for a DIY project. tillkrueger wrote: So if anyone can find a barrel connector to 2pin cable that's available *now*, please do link to it! or even the compatible version of the connector, on its own, for a DIY project. Just for the hell of it I am going to post this and you can make of it what you will. 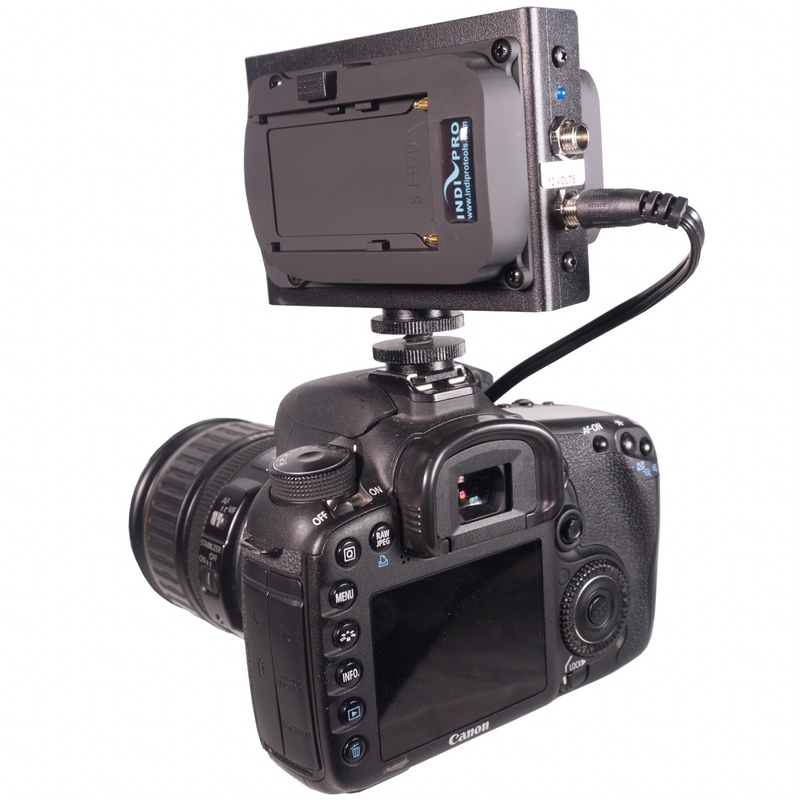 BMD’s cable bundle includes a 2.5 barrel connector to 2-pin cable to power the camera that way. Apologies, I was thinking of another item that used a dummy battery. This doesn’t require a dummy battery and so there’s no cautions about using this to power the BMPCC4K. If it looks awkward mounted to a cold shoe, it can mount to 15mm LWS rails. I think that might be best. Last edited by rick.lang on Sun Nov 11, 2018 5:58 pm, edited 2 times in total. The new model looks much better built than the original one Rick, good find. Ray, it’s regulated 12VDC via a barrel connector which just requires the right cable to mate with the 2-pin locking connector on the camera. That’s an ideal solution that you can mount on rails if you want. There are actually two 12VDC power outs on the Sony plate. Last edited by rick.lang on Mon Nov 12, 2018 2:41 am, edited 1 time in total. So it's more or less and alternative to a V-Lock system? I don't wish to be a damp squib on this, but the one listed for a Blackmagic: https://www.indiproco.com/dual-sony-l-s ... era/#tab-2, weighs nearly 2kg without batteries (same for all of them). My V-Lock 120Wh battery and mount weighs 1kg combined. What am I missing here? I had planned just to hang my V-lock from the tripod, but this solution seems more stable and secure, but it doesn’t come cheap. Adding what I have costs nothing but a cable. Adding the two big Sony batteries and the plate isn’t peanuts. But for those who already have the batteries, the plate makes a lot of sense. You can always get a Sony dual battery to V-Lock adapter that attaches to the V-Lock cradle. That way you can get the best of both worlds. Anyone have any links to which dummy battery and power bank would work best for this? For me, this makes the most sense to power the camera. I bought 9 crappy LP-E6 Batteries and I feel like they won't hold up too well when I finally get my camera. Reading the manual for the camera, I also see that you can use the provided 12v port on the camera to power and charge the battery so I'm curious if a simple 12V DC - USB cable into a power bank would also work just as well. If BM are saying that using these methods are okay to power the camera, I don't see why it would be a problem to just use a large 12000 mAh USB battery. No, I don't think you are missing anything, but I haven't found that many USB power banks that provide 9V or 12V output...maybe a list of links to those that do would be a great addition to this discussion. The Anchor bank that I have been using for 5+ years isn't made anymore, unfortunately, as it has been very reliable and provides 20,000mAh to 3 USB IQ ports (up to 10W each), and one DC barrel connector which can be switched between 9/12V. Who knows of other comparable USB power banks that aren't heavy/bulky? I haven't followed this thread or related discussions, but is there some reason products like the juicebox lithium battery ($120) aren't of more interest? The company says it's currently in production on the appropriate cable (available end of Nov.). They claim their battery gets 3.5 hours on the P4K. Last edited by John Paines on Mon Nov 12, 2018 3:25 pm, edited 1 time in total. tillkrueger wrote: No, I don't think you are missing anything, but I haven't found that many USB power banks that provide 9V or 12V output...maybe a list of links to those that do would be a great addition to this discussion. The Anchor bank that I have been using for 5+ years isn't made anymore, unfortunately, as it has been very reliable and provides 20,000mAh to 3 USB IQ ports (up to 10W each), and one DC barrel connector which can be switched between 9/12V. Not as big as mentioned but I have tested it by hitting record and letting it run for 2 hours. It was still above 50%. That's interesting. I own the same battery that I use to power some LEDs around the house and I see they sell a 22400 mAh version as well for about $68. Can I ask which dummy battery you use? I haven't been able to find anything that is LP-E6 dummy to 12v DC. Although I have a dummy battery (link below) I am actually using the side connector and the cable that came with the camera. I cut it at about the midpoint and put a female connector on the AC side and a male connector on the DC side (see photo). The male connector fits the battery. I used screw type connectors because I thought I'd being doing some experimentation and would eventually replace them with soldered connectors. But after initial tests I simply added some Sugru to the connectors and called it a day. I have included a link to the connectors. For completeness I have added a photo of the battery with belt clip I have attached. Again a link is provided below. I’ve already posted about the Mophie 3XL (45 watts) and the XXL (30 watts) for portable power banks. The IndiPro link I posted recently with the Sony dual battery plate with 12VDC barrel connectors can lead you to other dual battery solutions that provide 7.2VDC power for a dummy LP-E6 battery. Search on this forum or within the sites those links point to. Gotta be honest.. I think the CORE PowerBase Edge makes more sense than any of these. It is $259 at BH Photo..it comes with an LPE6 dummy option, has 8.4 regulated output, 14.8v if neeeded, dtap, usb, rails/vmount options, can mount right under the camera and is not that big (not much bigger/smaller than these other options), and weights .6kg. I dont know if its 49wh rating will give super long times.. but it looks pretty slick to me. I would go this route if I didnt already have 2 vmount batteries and a vmount distribution block. 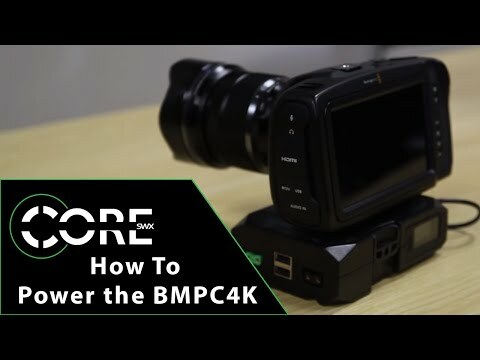 Justin, 49Wh is a very underpowered option for the BMPCC4K which likely draws up to 3 amperes and 45 watts when loaded with other things that use power. If nothing electronic is attached, that might give you 90 minutes runtime. That’s designed for less power hungry charging such as a boost for your phone. It’s alright for an emergency, but I don’t think it’s strong enough for most shoots that might require your camera to be on for a minimum of two hours. I guess if it’s used in addition to the internal battery you would get two hours. But with power you want power in reserve, not getting down to 25% capacity except in an emergency. I wonder why that Mophie 3XL is priced at $199, Rick...at that capacity, it really shouldn't be that much...there must be better bang for the buck options. We *will* find that perfectly sized, not too expensive, 5/9/12V switchable power bank with USB-C and DC barrel outputs, won't we? we've got to! sure, those V-mount and other packs are nice, but then we're back to a whole camera rig with cage and tons of attachments and cables and tethering you to the rig, or holding up a 15-20lbs rig that holds *everything*, including the battery packs, no cables tethered to you...totally obscuring the fact that we started out with a "Pocket" camera. My goal is to first figure out a rig that's light enough to hold with one hand, and then *also* figure out a rig that will make a client shiver with respect when I come in with it and plonk it down on a big tripod, looking like a weapon...like that TILTA setup would when fully decked out...the RED school of production gear aesthetic. Don't get me wrong, I like that, too. it can handle a max payload of 6lbs, so that'll be my limit with the PCC4K plus accessories, for now. but that's a discussion for my "Accessorising" thread. Justin, if that battery is 45Wh, I don’t understand how it can power a working BMPCC4K for four hours. The working camera consumes more than 11 watts. A standard Canon LP-E6N battery is 14Wh and from all evidence provides a max of about 45 mins recording time. So 45Wh is ~3 LP-E6N batteries, aka 2 1/4 hours. I can't see how it could provide four hours even if a Canon battery lasted an hour. I was thinking the same thing.. given that my 98Wh battery powers my Sony AX53 and Atomos ninja Inferno for about 3 hours. But that is two devices, both sucking down a decent amount of power I have believe the Ninja with its 7" monitor and SSD recorder is sucking more power than the BM4K with USB-C recorder and 5" monitor.. not for sure though. With the Sony sucking another 1/3 or so. 3 hours.. at half the battery would be about 1.25 to 1.5 hours give or take... I would say I agree that it should last about 3 hours. But the weight is also only .6Kg.. a lot lighter than some of the other options. Thus, I think for what you pay and get, its a pretty reasonable option comparatively speaking. Me personally, I love the idea of hot swap batteries. I hate the idea of potentially having to stop a recording (incl audio possibly) to swap out a battery. As long as the solution can have continual operation and some sort of battery indicator so you know it kicked over to another and you can swap the dead one out, that is good enough for me. So I guess the question is.. are people looking for the lightest weight longest running possible option.. or redundant battery regardless of weight so they can switch out without having to stop recording? For me, I am less worried about weight.. at least initially, and more worried about being able to go without stopping recording. That said, I dont have any idea if I would ever record for longer than an hour straight, other than possibly if I get to shoot some plays/recitals/etc, but even those have intermissions. My concern is recording on/off but forgetting possibly to change battery as I start to record something mid day.. and having it die. Having the dual battery setup (that supports hot swap) at least alleviates the concern that my camera shuts off while recording. The bigger concern once I get my gimbal.. is how to power the camera with said redundant battery solution OR non-redundant but easy-enough-to-swap WITHOUT it having to be on the gimbal and/or get in the way of the operation of the gimbal (e.g. cords getting in the way while gimbal is say going a lot of motion). I have yet to operate one of these gimbals, but there seem to be 2 primary movements that could cause an issue with power cords in the way. One is the 360 rotation one which only a few gimbals support but all the new ones coming out seem to support it. Very slick effect to do while recording rather than in post where you lose some of the video frame as you rotate it to cover for the corners and such.. by zooming in. The other is the motion where you start up high and sweep down to the ground.. or vice versa. I am not sure if a power cable would get in the way of that, as it is typically in one direction and the gimbal doesnt rotate in all 3 axis much. But I can see that being a possible situation where the gimbal might have to have the power solution with the camera. There is also the situation of using an external monitor.. seems to me some sort of wireless HDMI rig is the way to go with this.. unless the LAB 3 HDMI to phone thingy works well enough. But most gimbals wont have that built in, so it will be interesting to see how we can use an external monitor with a gimbal. There are some gimbals that provide an internal power cable that go from the handle to the camera support so that you don't have to worry about cable interference; however, I don't know off the top of my head which ones provide that option. My FeiyuTech a2000 provides something similar, but it's for triggering the shutter on specific cameras. You would think new models coming out today, knowing that cable management on a gimbal is an issue, would move to having all that handled. I would expect the LAB 3 would have it, as it has that built in HDMI thingamabobby... I hope the MOZA AIR-X has something similar. If not, then maybe the next round will as tech evolves, gets better/cheaper, etc.